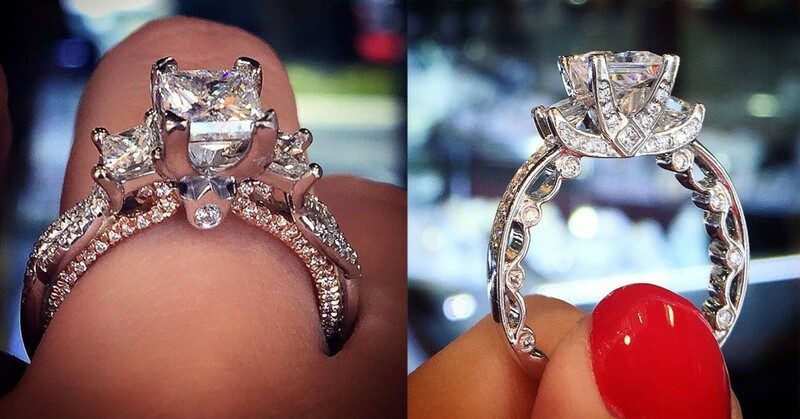 Our huge selection of engagement rings from every premium designer bridal line can be overwhelming. If you’re not looking at one specific designer (or even if you are) the best place to start is with the type of style you’re searching for. 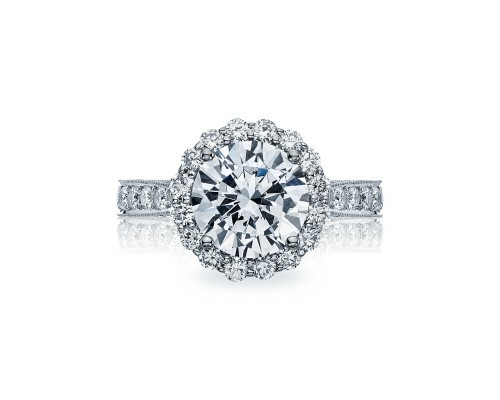 The classic engagement ring setting, a solitaire setting serves to highlight the center diamond. It beautifully showcases any diamond shape. 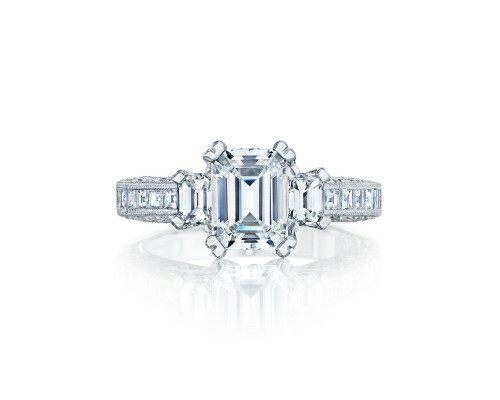 While it may seem traditional, the solitaire offers limitless opportunity to personalize using band style and width, metal color, micropave, and different setting techniques on the ring’s crown. The three stone engagement ring, as the name suggests, showcases three gemstones, meant to represent your past, your present, and your future. 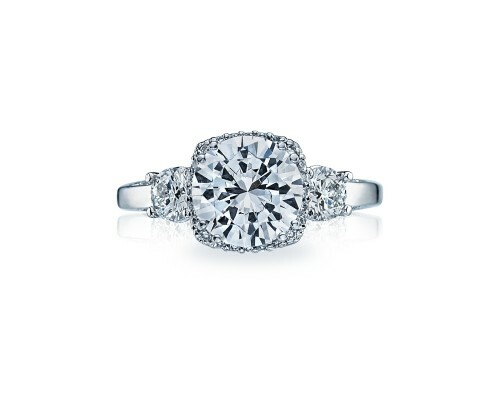 This style is as timeless as the solitaire, and again offers plenty of room for customization. The two side stones may be diamonds, or birthstones, or simply a gem you particularly love. It can accommodate any stone shape or combination of shapes, to create the perfect design for you. The channel setting can be combined with the solitaire or three stone style, halo, split shank and more. 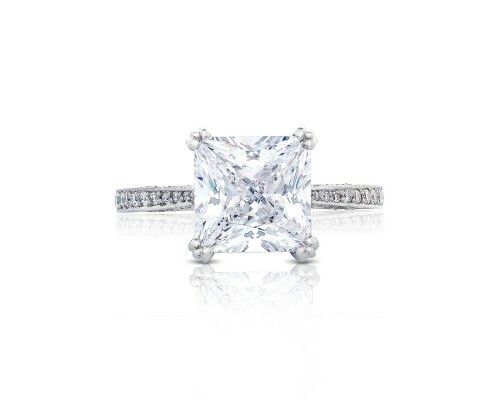 It is a technique of setting diamonds into the ring’s shanks without prongs to create a seamless, contemporary look. The diamonds in a channel setting are extremely well-protected, making this style a favorite among women who require higher than average durability from their wedding sets. Pave, sometimes called micropave, is another setting style for accent diamonds. This technique uses tiny beads of metal to hold small diamonds (called melee) in place. It creates a glittering, disco-ball effect that makes the ring look like it is “paved” with diamonds (hence the name.) 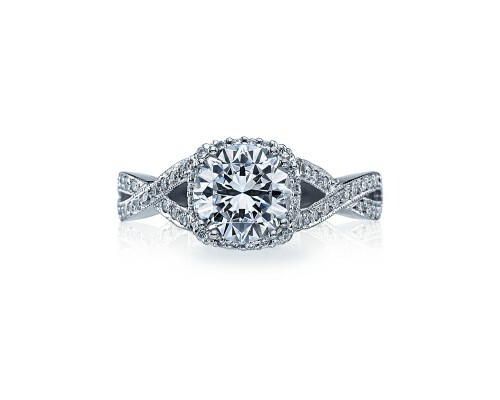 This is a gorgeous addition to any style ring, but shines particularly brightly in a halo setting. This very traditional setting technique is perfect for larger accent diamonds. 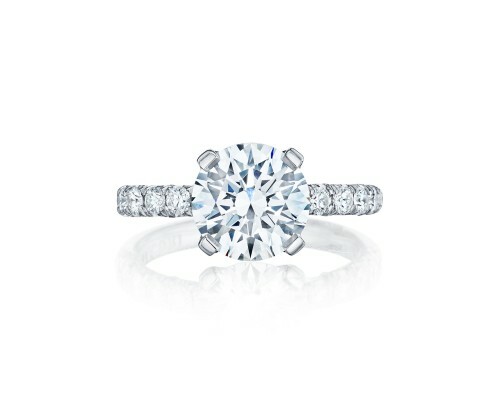 The prongs holding each diamond are shared with the next diamond lining the ring’s shank. It limits the amount of metal used in the ring, creating a floating effect on the diamonds, and allowing more light to work its magic on the ring. 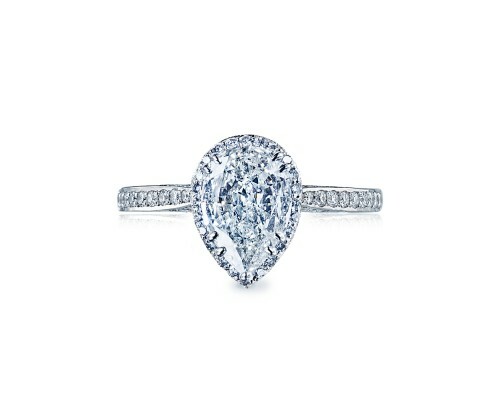 The halo setting uses a frame of diamonds to highlight the center diamond. 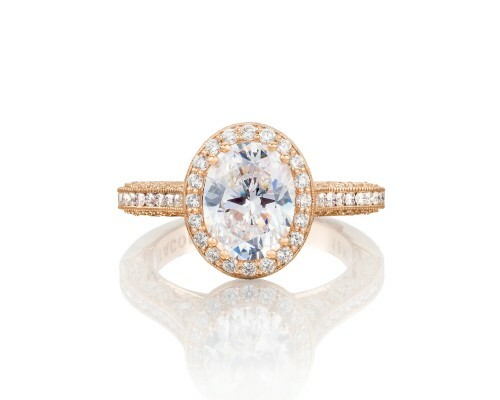 The size of the diamond halo varies greatly and creates beautifully unique looks to accommodate any bride’s style – whether she’s glamorous, sophisticated, whimsical or romantic. This style highlights the center stone and adds visual impact to the ring, giving it more presence on the hand and creating a larger looking ring. The type of material you choose for your ring will be determined by your taste and your budget. 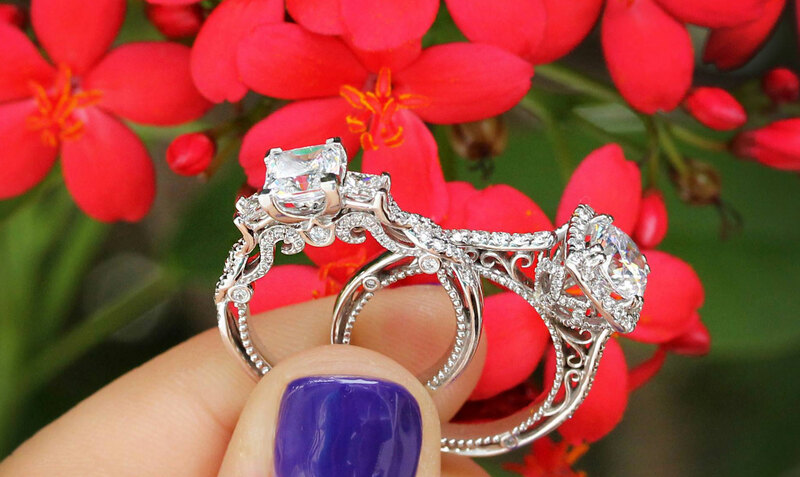 Today’s technology allows for a huge variety of metal types used in jewelry manufacturing, and the world of designer engagement rings is no different. 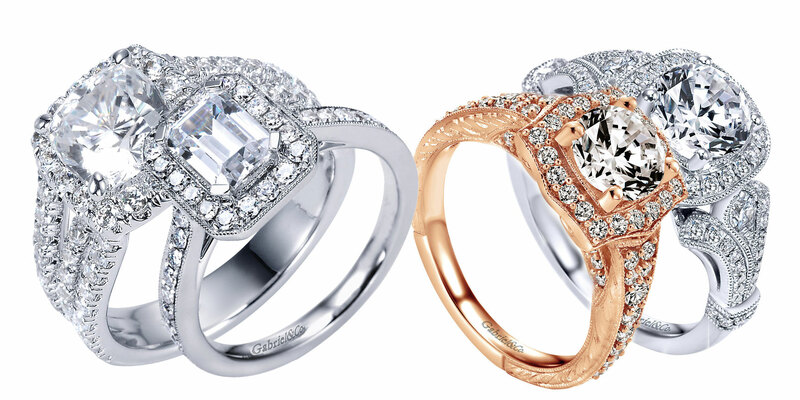 The vast majority of our settings are made exclusively with precious metals – platinum and gold. Our designer gentlemens’ bands offer a greater variety of alternative metals. Platinum is a naturally white metal that stays pristine – it won’t need refinishing in its lifetime. It is also a wonderful option for brides with metal allergies, as it is “jewelry-ready” in purity and doesn’t require added metals that may trigger reactions. Platinum is slightly softer than the jewelry-quality gold found in most rings, but this isn’t necessarily a bad thing. Because of its malleability, platinum is easily polished, shaped, and molded should your ring need re-sizing, repair, or diamond replacement. 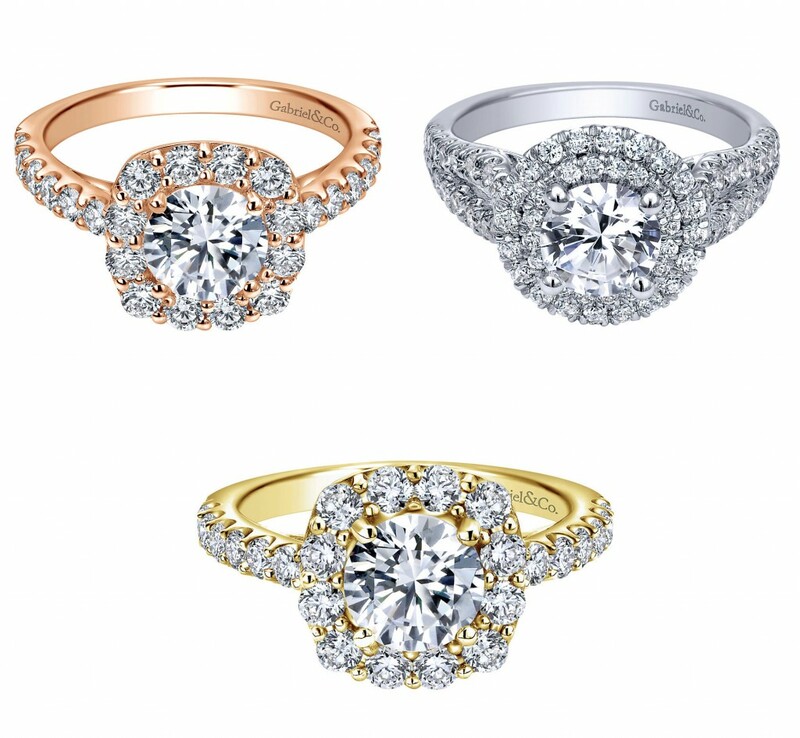 Gold, while naturally yellow, is popular among brides in both white gold and rose gold alloys. Pure yellow gold (24 karat) is incredibly soft, and is mixed with alloys to bring it up to jewelry-quality hardness. Karat weight represents the amount of gold in relation to alloys, so 18 karat gold is 75% pure gold, whereas 14 karat gold is about 58.33% pure gold. When gold is mixed with alloys to create white gold, it is usually paired with palladium, nickel, and zinc to give it a lighter, whiter appearance. It is then plated in rhodium to give it a bright, gleaming finish. This rhodium plating wears off over time to reveal the pale yellow patina of the white gold beneath, and needs to be refinished fairly often, depending on the wearer’s body chemistry. The re-rhodium finishing process is quick, inexpensive, and simple for us to perform. Palladium is a close relative of platinum, and shares many similar characteristics. It too is naturally white and will maintain its color without maintenance. It too is hypoallergenic thanks to its jewelry-ready purity, and has a similar hardness. However, it’s much less dense, and therefore unreliable to hold precious gems and diamonds. These characteristics make is a fantastic option for gentlemen’s wedding bands. Another favorite reserved for our gents’ bands, alternative metals are a hot trend. Their unique appearance and textures draw couples towards them, but most are not suitable for use in the intricate, diamond studded designs of our bridal engagement ring settings. However, these alternative metals (alternative to precious metals) are often much more cost-friendly than platinum, gold and palladium options. In the jewelry world, they include cobalt, titanium, and tungsten. These metals are hard, scratch resistant, and hypoallergenic for the most part, therefore requiring little maintenance. Because of that hardness, the rings are not easily re-worked, resized or engraved. They are also slightly more brittle and can chip or crack in a way that a precious metal band would not. Because of the risks associated with these fashion-forward styles, most gentlemens’ wedding bands designers have lifetime warranties on their alternative metal bands. This way should anything happen to your ring, your important purchase is always protected.